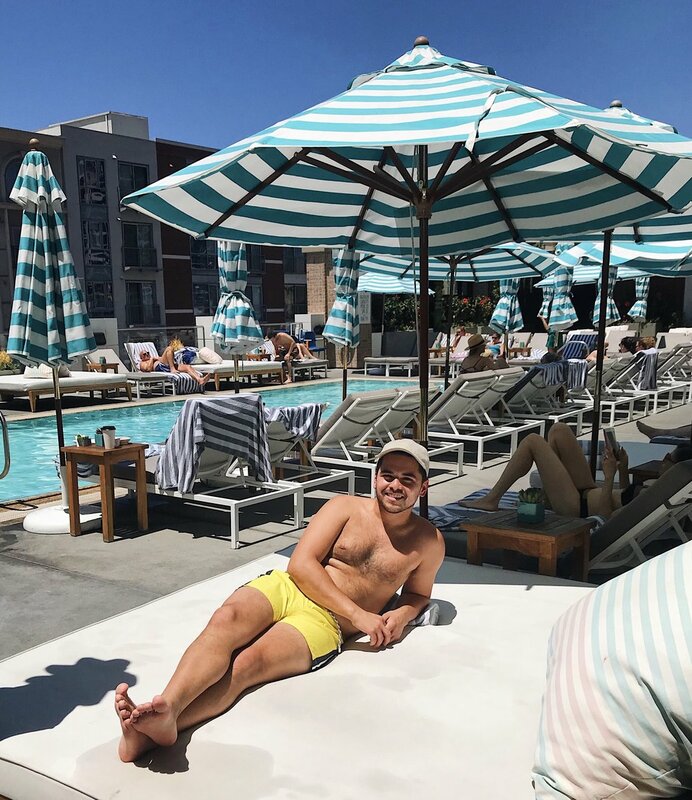 I don't think I can put into words how much I loved staying at the Pendry San Diego. From the moment I walked into the double doors I knew that this hotel was right up my alley. The bedroom: The room I stayed in was a king room & I was obsessed. If you saw my stories a few days ago, I couldn't keep from talking about how much I loved the room. The main thing that caught my attention was the bathroom/shower. I am a huge sucker when it comes to a well-curated space & this bathroom was gorgeous. Luck for you I took multiple pictures & decided to have my own little photoshoot in the mirror. I mean how could you pass that up? I did have some people reach out to me asking about the privacy of the shower. Yes, the shower is glass & located in the middle of the room. However, there is a curtain that warps all around the shower making it more private. The added bonus to this shower was not only did they have a normal shower head but they also had a rain shower head, which I am not sure is the right term, but it's the one that is located directly above you. One unique thing about the Pendry is that on the property they have 6 different and bar options that showcase the culinary skills in San Diego. 1. Provisional: a cute communal style restaurant where you can easily grab a coffee to chat or a nice brunch. One cool thing about this spot is that they have a greenhouse right in the entry that carries multiple retail products so you can shop. 2. Fifth & Rose: a chic cocktail bar located to the left of the hotel entrance. This space is, in a nutshell, is classic. When you walk in your just get a fancy yet comfortable vibe where you would want to spend the evening drinking an old fashion or nice glass of wine. One thing I loved about this spot was they had a branding tool that would mark their ice cubes with their logos...SO COOL!! 3. The Pool House: the perfect California living rooftop experience. During my visit, I went to the Pool House during a more chill time of day. This allowed for maximum relaxing & a nice escape from the walking the city. However, one cool thing about this spot is on the weekend/evenings this space is utilized as a fun, lively cocktail experience. Below are the 3 on-site properties I was unable to visit. I was bummed about this, however that only means I must go back! Ultimately, I would highly recommend anyone stay at the Pendry. The reason is that the hotel staff was incredibly nice & accommodating. Oh, I can't forget that every night they put macaroons on your pillow as part of the turndown service & they were delicious. Plus the location was in downtown in the Gaslight district which is filled with a ton of restaurants, bars, & activities. Everything was a short drive away from the beach, Sunset Cliffs, the mall, & other cute areas of San Diego. If you are planning on visiting San Diego anytime soon here is a link to booking that will apply a $60 breakfast credit & complimentary parking! I hope you enjoy & if you have any questions let me know!